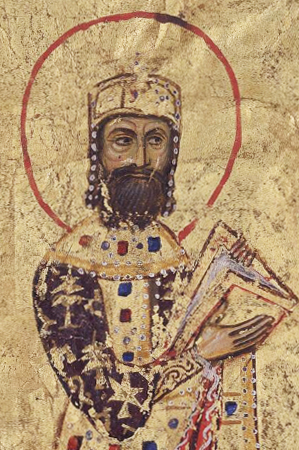 Alexios I Komnenos (Greek: Ἀλέξιος Αʹ Κομνηνός, c. 1048 – 15 August 1118) was Byzantine emperor from 1081 to 1118. Although he was not the founder of the Komnenian dynasty, it was during his reign that the Komnenos family came to full power. Inheriting a collapsing empire and faced with constant warfare during his reign against both the Seljuq Turks in Asia Minor and the Normans in the western Balkans, Alexios was able to curb the Byzantine decline and begin the military, financial, and territorial recovery known as the Komnenian restoration. The basis for this recovery were various reforms initiated by Alexios. His appeals to Western Europe for help against the Turks were also the catalyst that likely contributed to the convoking of the Crusades. Alexios was for many years under the strong influence of an eminence grise, his mother Anna Dalassene, a wise and immensely able politician whom, in a uniquely irregular fashion, he had crowned as Augusta instead of the rightful claimant to the title, his wife Irene Doukaina. Dalassene was the effective administrator of the Empire during Alexios' long absences in military campaigns: she was constantly at odds with her daughter-in-law and had assumed total responsibility for the upbringing and education of her granddaughter Anna Komnene. Maria Komnene (9 September 1085 – after 1136), initially betrothed to Gregory Gabras, but married to Nikephoros Katakalon. The couple had at least five children. Ioannes II Komnenos (13 September 1087 – 8 April 1143), who succeeded as emperor. Bury, John Bagnell (1911). "Alexius I.". In Chisholm, Hugh. Encyclopædia Britannica. 1 (11th ed.). Cambridge University Press. p. 577. ^ "Archived copy". Archived from the original on August 7, 2007. https://web.archive.org/web/20070807042036/http://www.doaks.org/CoinExhibition/CaseI/Case1_16_17.html. Retrieved November 14, 2015. ^ Dalven, Rae (1972). Anna Comnena. New York: Twayne Publishers. pp. 67–69. ISBN 978-0805722406. https://books.google.com/books/about/Anna_Comnena.html?id=k4tiAAAAMAAJ. (2005) "Commémoraisons des Comnènes dans le typikon liturgique du monastère du Christ Philanthrope (ms. Panaghia Kamariotissa 29)" (in French). Revue des études byzantines 63: 41–69. DOI:10.3406/rebyz.2005.2305. Varzos, Konstantinos (1984) (in Greek). Η Γενεαλογία των Κομνηνών. A. Thessaloniki: Centre for Byzantine Studies, University of Thessaloniki. OCLC 834784634. http://www.kbe.auth.gr/bkm20a1.pdf. Skoulatos, Basile (1980) (in French). 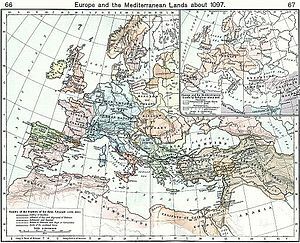 Les personnages byzantins de l'Alexiade: Analyse prosopographique et synthèse. Louvain-la-Neuve: Nauwelaerts.